887 AD, Holy Island, English Northumbria: As blood rain falls and the dead rise, Viking invaders and English monks must join forces or perish in a Lovecraftian nightmare. 1287 AD, Iwaizumi, Japan: Snowbound Samurai must unearth what lies behind the village where babies cannot cry and an abomination hangs lanterns that shriek with a thousand voices. 1487 AD, Valencia, Spain: Heretics must escape torture, prison, and the clutches of angels to expose the Spanish Inquisition’s true purpose. 1587 AD, Roanoke Colony, The New World: Colonists face flayed horrors that hammer on stretched-skin drums to reveal whose knife dug CROATOAN into the Lost Colony’s tree. 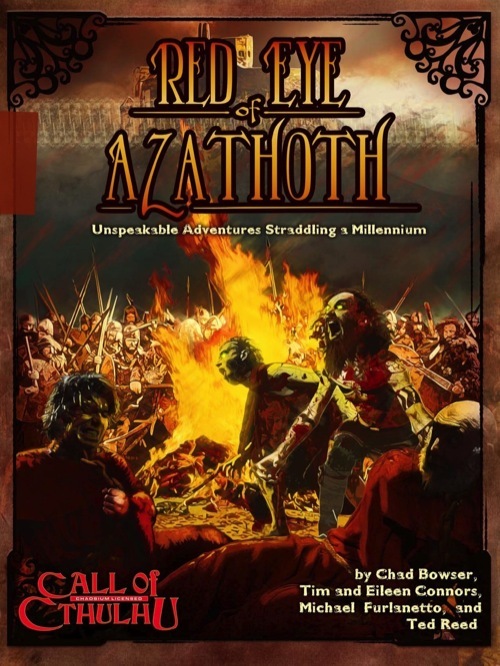 1887 AD, Desperation, Arizona Territory: In the series’ explosive magic-and-gunpowder climax, condemned gunfighters unravel the last skeins of the millennium-spanning mystery and stand alone against the full Mythos horror of The Red Eye of Azathoth! This is the second product I have reviewed that I feel the 5 star award method fails to express how utterly amazing a product is. Way to go Open Design for raising the bar on awesome! I see with my editor's eyes a sentence in my review that got itself misplaced. Hard to say since my old CoC stuff is all in print and some of it is literally falling apart. My copy of this is digital. It looks like it might be a mighty fine looking book in one's hands, judging from the pdf anyway. If I had the money, and could also snag the CoC rules compendium thing I got sitting in my save for later pile, I'd get them both. Edit: IMO the old CoC rules set fit the theme much better than the D20 system. Ahh. Thanks for the reminder, I had forgot about this. Purchased and added to my CoC collection. Looks great! I've got the dead-tree-version and its a softcover of the same quality as the other OD-projects, i.e. it is glued, letterpack-format, b/w and there's nothing wrong with it. How does the design of the book look in comparison to other CoC books? As a book that is published in digital format only (it looks like patrons were able to pre-order print copies, but other people just have the PDF option), it might be worth noting that it looks bad on the iPad (the background image repeated on every page being displayed on the bottom half of the page only). Huh. I didn't realize the print copy was patron only. That's weird, because it has an ISBN and $19.99 price on the back cover, which would be strange for a PDF-only publication. My personal take on it: it's a cool adventure; and the five parts, I think, get better as they go (kind of the opposite of Sucker Punch). Frankly, I don't get much of a Lovecraftian vibe from most of the episodes, but as I mentioned I can't compare it to any other CoC adventures so that might not be unusual for a reader of the actual adventure. Yep, the print edition was patron-only. Rather a small number of copies. And it is more an action epic across continents rather than a slog through the university library, so in that sense, not very Lovecraftian. Red Eye of Azathoth is a well executed beautiful work with plenty of material to steal for your regular game and a rarely attempted but expertly handled setup. If you’re a regular CoC keeper, this is a product you’ll want to get your hands on. By basic math alone, this is a collection of five professional quality linked one-shot scenarios at $2 each. How can you afford NOT to buy a copy? Big thanks to Charles Carrier for the second 5-star review of this book! I especially like the breakdown of why it works, and I sort of agree on the round numbers critique. Finally reviewed here...as my 600th review on Paizo. Also reviewed on DTRPG, sent to GMS magazine and posted about it on Lou Agresta's RPGaggression. Cheers! Holy crap! Congrats on that milestone and thank you for such vigilant reviewing. Another campaign to add to my list of campaigns I want to run. So on top of my ongoing DC Adventures game, and my Rogue Trader game, I've got to find time to run Fire Mountain Games Way of the Wicked, and now this one as well, on top of playing in the Pathfinder game that I'm in. One of the things that really has me intrigued about this one is that the time jump with different characters in different eras facing an ongoing menace across time reminds me a lot of Eternal Darkness, the criminally under appreciated GameCube game. Thanks Adam! Keep on livin' the dream and writing awesome stuff!